Strozier’s (Until the Fires Stopped Burning: 9/11 and New York City in the Words and Experiences of Survivors and Witnesses, 2011, etc.) 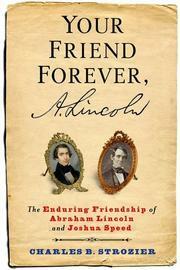 first book on Lincoln, Lincoln’s Quest for Union (1982), was a psychoanalytic study of the president containing one chapter about his close friendship with Joshua Speed from 1837 to 1842. The misunderstandings and insinuations of a homosexual relationship have led him to write this account of their friendship. They met at Speed’s store. Since Lincoln was broke, Speed offered to share his room and bed with him at no charge. This was the gathering place where Lincoln polished his narrative talent. The two men lived together for almost four years, and Speed largely became the center of Lincoln’s emotional well-being, assuaging his fears while sharing his own inadequacies. Both men suffered from depression, and both had endured troubled relationships with their fathers. Speed was known as a lady’s man, while Lincoln was painfully shy. Speed was a born businessman, eventually becoming very rich—too rich to accept a cabinet post in his friend’s administration. Lincoln was poor, but he was certain of his future greatness. Lincoln’s fall into depression and thoughts of suicide after his broken engagement were only relieved with Speed’s help. William Herndon, Lincoln’s law partner, collected an oral history after Lincoln’s death. While Strozier uses it as one of his sources, he warns the work should be taken with a grain of salt. As a slave owner, Speed didn’t even vote for Lincoln, but he was largely responsible for keeping Kentucky in the Union. Lincoln trusted him so much that he even showed him the draft of the Emancipation Declaration. Speed’s marriage and move to Louisville left Lincoln desperate for his “crutch,” but it also freed him to renew his proposal to Mary and work to overcome his debilitating depressions on his own. An enjoyable look at a man on the “edge of politics” who had a strong influence on Lincoln’s development.